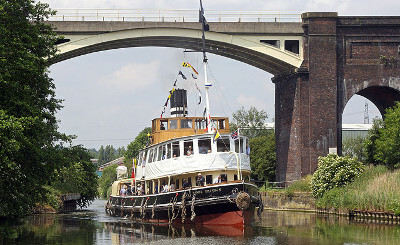 A 116 YEARS old steam ship is offering cruises on the Weaver. The SS Daniel Adamson—better known affectionately as ‘The Danny’ will be cruising all the navigable Weaver offering a variety of cruises, including specialty gin themed events, Alan Tilbury reports. The ship was built in 1903 and used to tow barges on the Mersey, and has since been used as an operational tug and latterly being used for corporate hospitality. The coal fired steam driven ship survived two world wars and was in service until 1984, and saved from the scrapyard in 2004. The Danny was restored to her original 1936 condition at a cost of £5 millions that was partly funded by the Heritage Lottery Fund. It is now owned by the Daniel Adamson Preservation Society and is registered on the National Historic Ships Register in the same elite group as the Cutty Sark and SS Great Britain. She is crewed by volunteers. The cruising programme will start in May, and in addition is open at weekends with free guided tours.